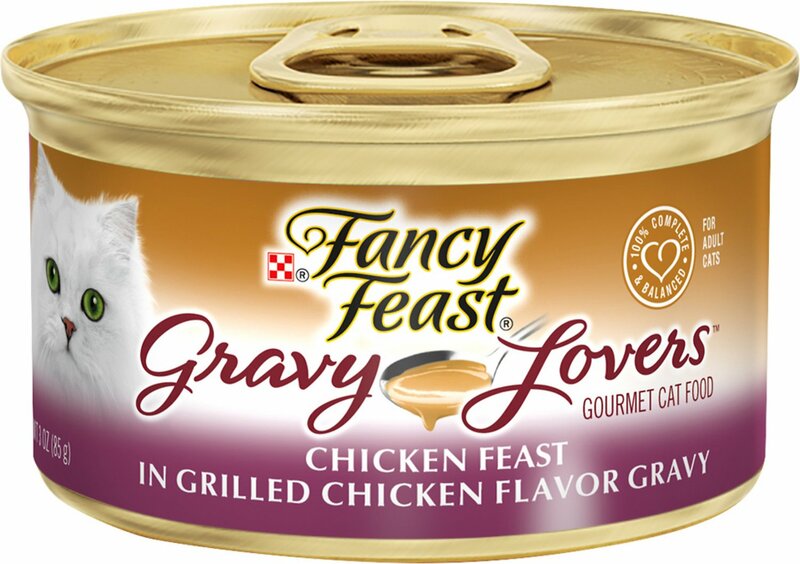 Turn mealtime into a feast with the Fancy Feast Gravy Lovers Chicken Feast in Grilled Chicken Flavor Gravy Canned Cat Food. “Give me meow yummy,” your kitty says. 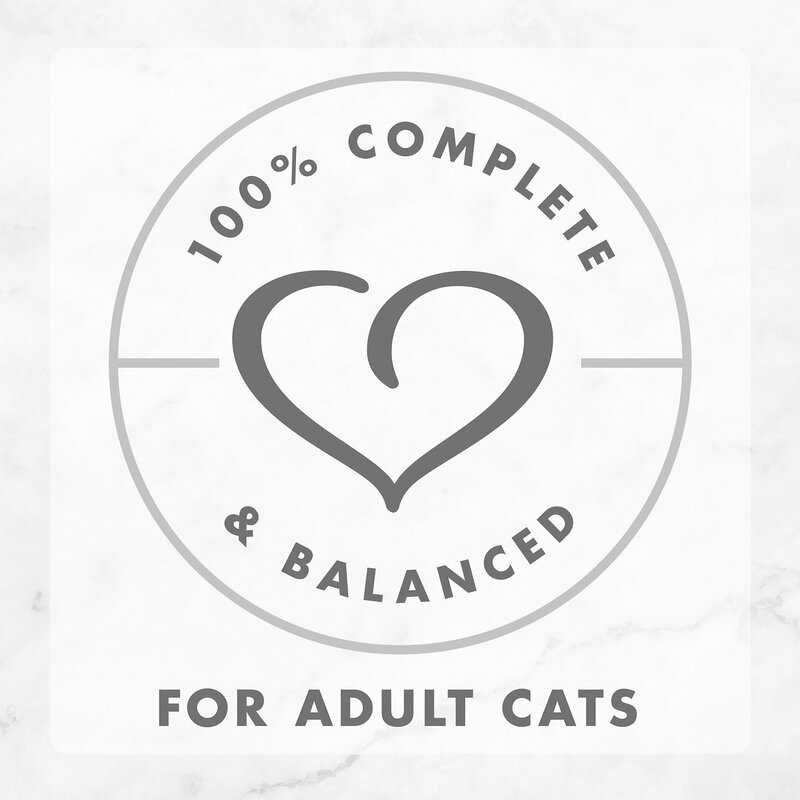 So fill his bowl with whisker-licking chicken, and pretty much everything he needs to stay looking and feeling his best, like protein, antioxidants and healthy omegas. Plus, the formula is enhanced with vitamins, minerals and essential taurine for nose-to-tail well-being in every bite. Since it’s made with real broth, it also provides moisture to keep your pal hydrated and support urinary health. So open up the easy pull tab and get ready for all those satisfied kitty smooches. The tasty recipe features real, savory chicken for the high-protein nutrition your little carnivore craves. 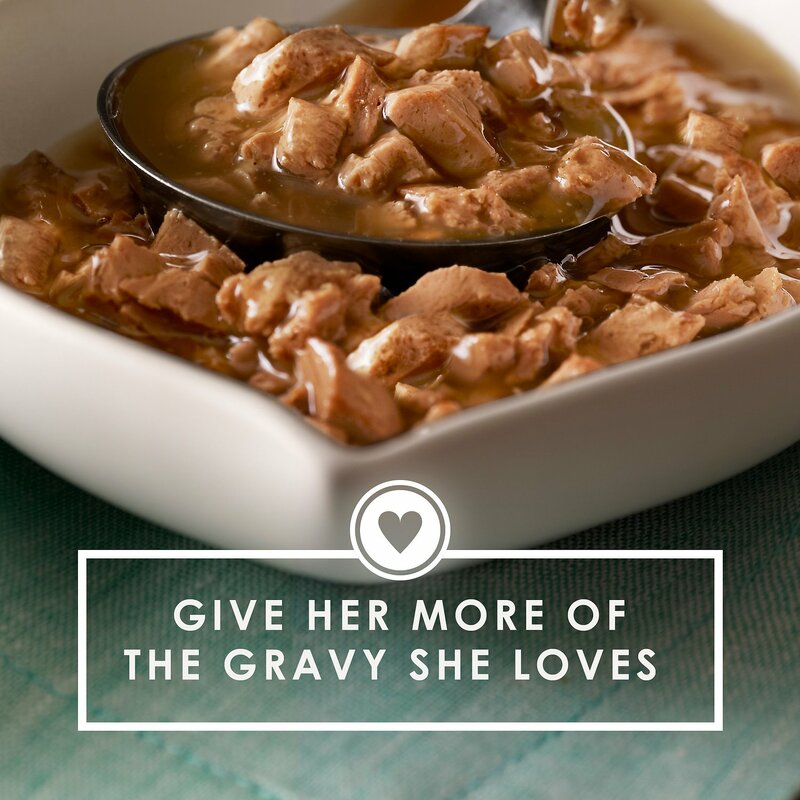 Rich, thick gravy adds flavor and moisture to your kitty's diet. Small, delicate bites offer a tempting texture for extra excitement. 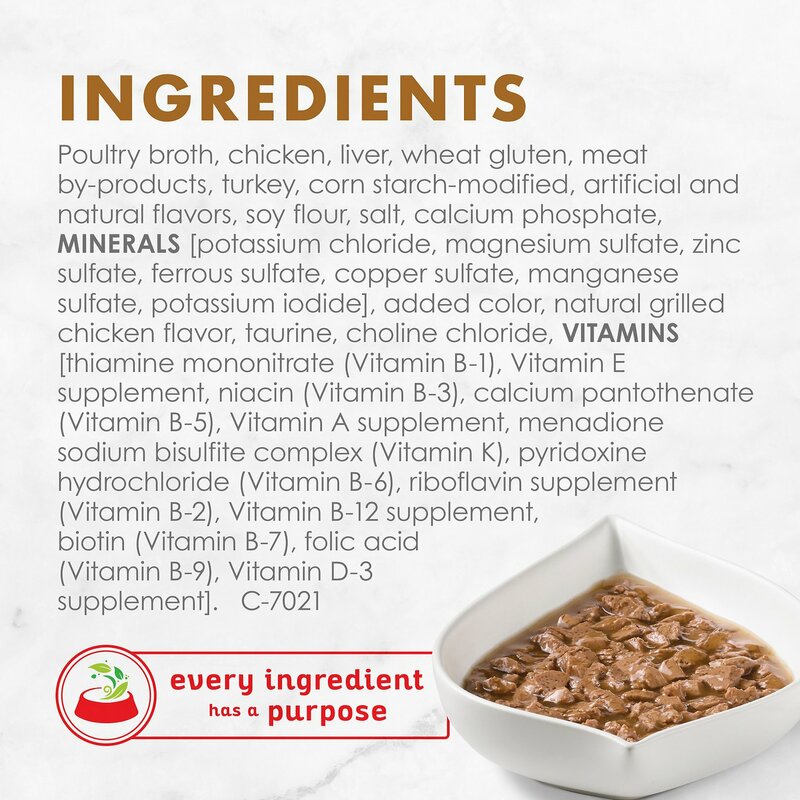 Poultry Broth, Chicken, Liver, Wheat Gluten, Meat By-Products, Turkey, Corn Starch-Modified, Artificial And Natural Flavors, Soy Flour, Salt, Tricalcium Phosphate, Added Color, Potassium Chloride, Natural Grilled Chicken Flavor, Taurine, Choline Chloride, Magnesium Sulfate, Mono And Dicalcium Phosphate, Thiamine Mononitrate, Vitamin E Supplement, Zinc Sulfate, Ferrous Sulfate, Niacin, Calcium Pantothenate, Vitamin A Supplement, Copper Sulfate, Menadione Sodium Bisulfite Complex (Source Of Vitamin K Activity), Manganese Sulfate, Pyridoxine Hydrochloride, Riboflavin Supplement, Vitamin B-12 Supplement, Biotin, Folic Acid, Vitamin D-3 Supplement, Potassium Iodide. 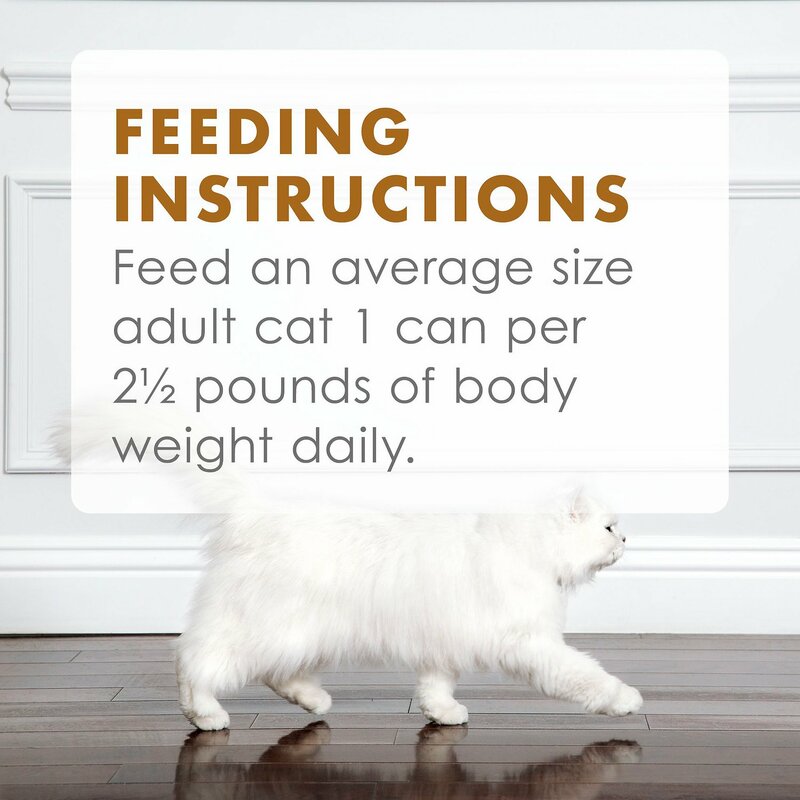 Feed an average size adult cat 1 can per 2 1/2 lbs. of body weight daily. Feed up to twice this amount to kittens. 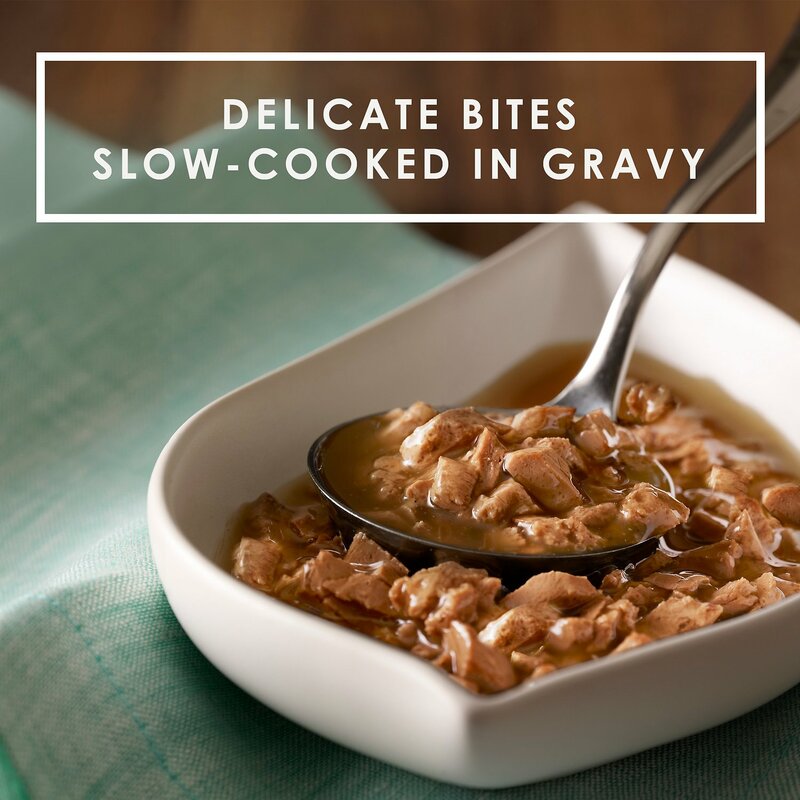 Fancy Feast Gravy Lovers recipes are overflowing with tender, succulent pieces of beef, chicken, ocean whitefish, salmon or turkey in thick, delicious gravies for hearty meals bursting in flavor. Every bite of Fancy Feast Gravy Lovers is brimming with meat that is slow cooked until tender and dripping in savory gravy. Nothing but the best will do for your kitty, and these meals are satisfying feasts your cat will ask for again and again. Plus, each cup contains a small, dainty portion that is easy for your kitty to eat. 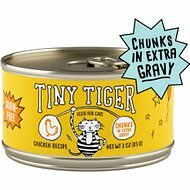 These recipes are so rich and wet with gravy that they're great toppers to add to your cat's favorite Fancy Feast Gourmet Dry Cat Food for a new level of flavor and added nutritional value to her daily meals. Plus, the easy-access cans make these quick, savory meals your cat can sink her teeth into. Cat recently lost his teeth due to old age and switched to canned food. He seems to lick the gravy and not eat the chunks but he's getting better. Chewy however has best price and fast shipping so the five stars are for Chewy more so than the food. This works great when I have to give daily medication. The gravy covers up the pill and liquid meds. Much better that trying to poke something down their throats. I have two handsome tuxedo cats. Since they're always formally attired, I believe it's in good taste to keep them happy at mealtime. They absolutely LOVE Gravy Lover's Fancy Feast! One of my guys is a king sized kitty, so I wish Fancy Feast would consider selling larger sized cans. This is their favorite canned food, so it gets the tuxedo stamp of kitty approval! My cats love this. Although I’m not sure how good it is for them because it has lots of gravy in it. But to get them to eat, they want gravy. The fancy feast gravy lovers flavors have lots of gravy that my cat loves. She doesn't like the more solid fancy feast meat flavors. I have 10 cats and each night I put out 2flavors of Friskies filets and 2flavors of classic Fancy Feast along with one flavor of Fancy Feast Gravy Lovers. I can’t quite tell which gravy lovers they like best but I know they do love this chicken flavor. They always finish all of it! I am not happy. With 10 lbs. cost me $6.00 and color different. Always gray. I have to throw away. Today. Next time better gray litter. Wish I can send picture. S/O for Psycho. Thanks. Happy cat! Quick shipping and great price! My cat loves fancy feast chicken the best. Gotta keep those cats happy now don't we. Chewy gives 30% off your first auto ship which makes me happy too.